Never promise, never lie. That’s the personal mantra of hostage negotiator Dominic King (Trevor Eve). A veteran of the gulf war, King now works for a London-based company which provides ‘kidnap insurance’ to high-value corporate employees working in some of the world’s most dangerous trouble spots. King’s job isn’t about taking justice to the bad guys- it’s simply about negotiating a price, and bringing the hostages home. There is no good or evil, only the deal. After reeling from a bad transaction where the hostage ends up dead, King is sent on another, more dangerous mission to South Africa. This time a botanist named Naomi Shaffer (Emma Fielding) has been targeted by kidnappers, and it’s up to King to broker a deal for her release. But these small-time bandits turn out to be the least of his worries, when an ex-military unit led by Willard (John Hannah) becomes involved. King comes across as a true maverick, shrugging off the intervention attempts of the British consulate, the police, and even his employers, with the single-minded goal of seeing the deal through. 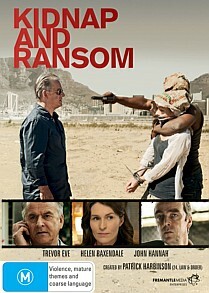 There is a lot of moral ambiguity about ‘Kidnap and Ransom,’ and it makes for a thoroughly entertaining experience. Dominic King isn’t quite the good guy- he’s actually quite ruthless in his methods, not hesitating to use emotional blackmail in order to get the result. The metaphor of a chess game is used quite a bit throughout the show, and you get the feeling that it is used ironically; the characters exist somewhere apart from the black and white, in a world filled with shades of grey. Adding a human aspect to the story are Dominic King’s interactions with his wife and daughter; for all his ability to reason with a crazed gunman on the other end of a telephone, he seems remarkably inept at communicating with his own family. The production values are top-notch for a television mini-series, with some evocative shots and excellent make-up. The soundtrack is unobtrusive but effective, and the simple notes of the show’s theme lingered in my head long after the credits. The writing is razor sharp, on par with the best you can expect from 24 or Spooks. John Hannah’s deadpan performance as the villain is a real treat to watch, and his conversations with King are the highlight of the final episode. If there is a downside, it would be the constant use of flashbacks, especially in the second of the three episodes. They jar you out of the story and come across as being filler; by the middle of the last instalment you just wish they’d finish so you can go back to enjoying the show. The final episode would have to be the weakest, because as the plot becomes more complicated, it starts to strain credibility. Would seven years of complex medical research really fit on a single A4 sheet of paper? Thankfully it doesn’t do too much to dull the shine of an otherwise brilliant and believable thriller. The single Featurette on this disc is an interview with actor and executive producer Trevor Eve, in which he talks about bridging the gap in quality between film and television. He also recounts meeting with actual hostage negotiators in his attempt to add a depth of realism to the show.